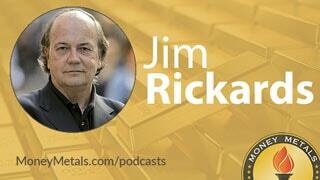 Coming up we have Jim Rickards, author of the book The New Case for Gold. Jim reports on some alarming evidence of a gold supply shortage developing across the world and the increasingly dangerous folly of central bankers. So don’t miss an encore presentation of our extremely important interview with Jim Rickards, coming up after this week’s market update. Investors are bidding up gold and silver prices ahead of next week’s Federal Reserve meeting. The odds of a Fed rate hike have diminished since last Friday’s disappointing jobs report. But Janet Yellen is still sticking to her story about an economic recovery. In a speech delivered Monday, the Fed chair said it was likely that the Federal funds rate would be gradually increased in the months ahead. It’s essentially the same line she’s been trying to feed investors all year. And now with clear battle lines being drawn in the election between Donald Trump and Hillary Clinton, Yellen would seem to have every incentive to continue playing this game of talking up the economy and the likelihood of rate hikes but never actually hiking. Of course, the Fed insists it is above playing politics. But the Clinton campaign machine certainly doesn’t mind having an Obama-appointed Democrat heading up the central bank during a contentious election season. The Fed’s powers to provide stimulus might even help boost the public’s mood before people head into the voting booth. That would be awfully convenient for team Hillary. But it would be purely coincidental and unintentional if it happened. Of course. Right now, markets are behaving well for the political and financial establishment. The Dow Jones Industrials is nearing a new high for the year this week and bond yields are falling on growing doubts about the Fed’s willingness to hike rates. The 10-year Treasury note yield fell below 1.7% for the first time in over a year. Perhaps that will stimulate more refinances, more home sales, and more new car purchases. But the Fed’s easy money policies are now also starting to stimulate inflation indicators. Last month’s Consumer Price Index reading showed the biggest jump in more than three years. And this week crude oil prices poked up above the $50 per barrel level. Turning to the precious metals markets, gold prices are up 2.6% this week to trade at $1,277 an ounce. The gold mining stocks continue to lead gold spot prices. The HUI gold stocks index closed Thursday at a fresh new high for the year and the GDX index followed suit this morning. Gold has yet to take out its April high near $1,300. But the bullish technical picture for gold stocks suggests gold itself could rally to new highs in the days ahead. In another encouraging sign, silver is surging this week to outshine gold. Silver shows a weekly gain of 5.6% through this Friday morning recording to bring spot prices to $17.39 an ounce. The platinum group metals are lagging a bit, with platinum prices up just 1.0% this week to trade at $999, while palladium is actually down 0.7% and comes in at $552 per ounce. As precious metals prices rise, expect more in the media and the general investing public to take notice of the potential to profit. Rising metals prices will also unfortunately attract more scam artists who are looking to cheat people. The American Numismatic Association reports that this year has already seen a surge in counterfeit coins and bars. Many of these fakes originate in China and end up being peddled in U.S. flea markets or on the Internet through sites such as E-bay and Craigslist. No legitimate coin dealer will knowingly peddle fakes – but some of the fakes out there are good enough to fool some mom and pop shops and E-Bay hobbyists and retailers. You can reduce your risk of being scammed by buying only through reputable dealers and avoiding high-premium numismatic or collectible coins. Numismatics have always been a favorite of counterfeiters because just slightly altering a coin or its grading can dramatically inflate its perceived market value. Common tactics include changing dates or mint marks on coins or affixing fake “mint state” grades to plastic coin slabs that appear to come from a major grading service. Here at Money Metals Exchange, we don’t sell slabbed numismatic coins or other risky propositions. We sell common bullion products that come from government mints and reputable private mints. And our quality control and testing measures are second to none so every product that comes in the door is fully scrutinized and analyzed for authenticity before it’s shipped out to a customer. And you’ll know up front exactly what you’re getting in terms of weight and purity. You’ll know you’re getting a specific quantity of actual precious metal and not a paper substitute or a Chinese knockoff or a false promise of rarity value. As always, the safest, most direct way to participate in a bull market for precious metals is to own the metals in physical form and avoid paying high premiums above spot. Jim Rickards: I don't think it's a question short-term versus long-term perspective. I think the problem is that all of these experiments the Central Bank is conducting are based on models, and the models are flawed. The models are not a good representation of reality. They're actually either obsolete or just wrong in the sense that they don't offer a good description of reality. Jim Rickards: I think something like that will happen, but I don't believe it will come about because of some unilateral power-play on the part of China and Russia. Look, China and Russia are acquiring thousands of tons of gold. It's very clear. We don't have to guess. The Central Bank of Russia is fairly transparent. The People's Bank of China is much less transparent, but we have good information from mining output and Hong Kong exports into China, and the split between retail and government demand to form a reasonable estimate of how much China's getting, probably they have 4,000 tons, perhaps more versus about 1,700 tons that they admit to. So they have a lot more gold than they admit. Now the reason China's doing it is not to launch a gold-backed yuan, a global reserve currency around the dollar, I'm not saying that those things absolutely could not happen, but that's not their short run play. The Chinese know that the yuan is not really ready to perform a true reserve currency function, but what they are doing is hedging their position in U.S. Treasury Securities. Jim Rickards: It has an exhaustion point, and the reason we know that is we've seen three price suppression mechanisms fail in the past 90 years. Go back to the 1920s, 1930s that the gold exchange standard that we talked about earlier where they set the price of gold artificially low, that failed because people said, "Well I'll just take the gold," and they couldn't maintain the pegs, and they were losing gold. One by one they had the devalue their currencies. France in 1925. England in 1931. The United States in 1933. France and England again in 1936 under the Tripartite Agreement. So that ultimately broke down, and the entire international monetary system broke down in 1939 with the beginning of World War II.